Ken Kavula and I spent the weekend in Pittsburgh with a couple of groups of disciplined long-term investors. 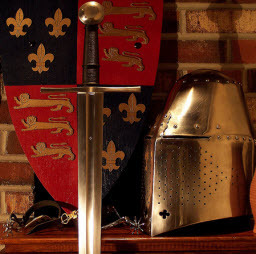 It seems natural to think of extending beyond iron … and instead, think about steel on steel — and the process of sharpening other like-minded investors. Some of the earliest model clubs were formed in Pittsburgh a couple of decades ago. In fact, one of them received a 20-year certificate this past weekend. And we note the considerable learning and sharing promulgated by a group of people, including but FAR from limited to: Herb Barnett, Pat Donnelly, Theresa Greissinger, Terry Lyons, Larry Robinson, 2011 Groundhog Champion Nick Stratigos and a wide variety of other volunteers and contributors. We’ve followed the Pittsburgh groups of investors for quite some time — and on this weekend did some quick benchmarking. One club had a +5.5% relative return over 20 years — absolutely exceptional and another checked in at +1.0%. Still another checked in at +0.8% … all in all, some 60-80% of the clubs involved this weekend have generated positive relative returns. Placed in the context of negative 1-2% relative returns for an institutional investing universe and the NEGATIVE 5.6%/year (over 20 years) for “average investors” documented by DALBAR — we’re talking about some exceptional people and some highly differentiated performance. 1. Imagine. Build an expectation of what the companies you study and own will look like in five years. 2. Invest in the Best. Comprehend quality. 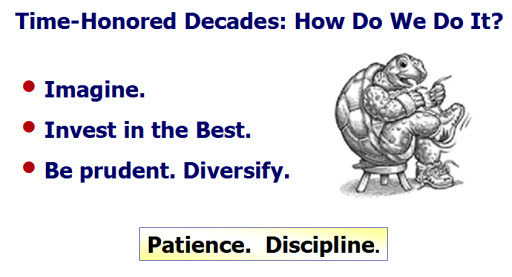 Recognize that quality is an insurance policy during corrections, bear markets and recessions … and a bedrock of consistency for long-term results. 3. Be Prudent. Diversify. Be certain to design and maintain a portfolio with the right mix of small, medium and large companies with an overall growth forecast that is sufficient. What is sufficient? A weighted average of 10-12%. We’ll gather for the April Round Table on Tuesday, April 30 at 8:30 ET. On wings of steel and a relentless quest to not only be a better investor … but to improve the experience of our friends and colleagues on this journey, we look forward to sharing some of our best ideas with all who gather. Pittsburgh-based Rue 21 (RUE) is among some of the more interesting shopping opportunities this week. It’s joined by legacy community favorite Bed Bath & Beyond (BBBY) as this retailer seems to have returned to broader appeal after something of a shakeout hiatus. We’ll be taking a closer look at BBBY this week. There weren’t a lot of shoes (or purses) dropping in this weekly update. Most of the adjustments to the long-term low price forecast amounted to nudges. Several of the companies with the highest return forecasts were trimmed — but not enough (less than 20% change) to be mentioned in the Materially Stronger/Weaker roll call. 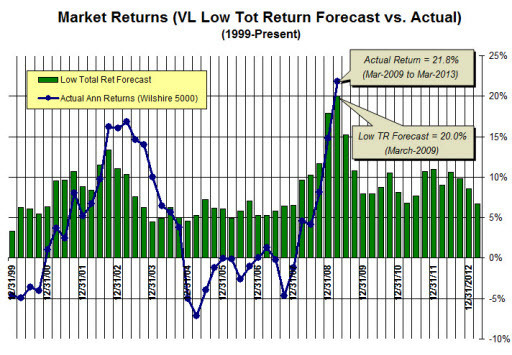 The “Big Boxes” like Wal-Mart (WMT), Costco Wholesale (COST) and Target (TGT) all got modest boosts for their long-term low price forecast. No one is quite sure what to expect from the management change at J.C. Penney (JCP) … a flood of traditional discount coupons notwithstanding … but the low price forecast was dropped from $20 to $15. We’re not sure what to think of the massive forecast adjustment (from $20 to $35) in Best Buy (BBY) but it’s probably in line with recent price action … and we’ll adopt a show-me position, perhaps a little skeptical as to whether the fundamentals will really improve all that much, or that suddenly. Value Line also took their foot off the brakes at GNC Holdings (GNC). 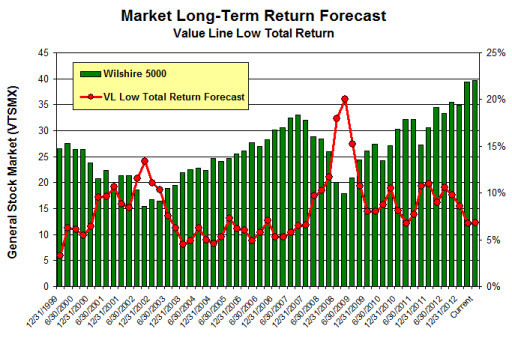 Coldwater Creek (CWTR) went from $2 to $3 (+50%) for the 3-5 year price forecast. Caveat emptor. The Value Line low total return (VLLTR) forecast is 6.8% this week, compared to 6.8% last week. The long-term range for the VLLTR varies from low single digits to approximately 20%. The current value of 6.8% is at the low end of the range — suggesting that an emphasis on highest-quality stocks is in order. The relative strength index for the Wilshire 5000 is overbought, but this can remain this way (for markets, sectors and individual stocks) for an extended period. We’re more vigilant and concerned about RSI “breaks” like the one on display here back at Halloween 2007. The caution flag is up — but no sign of an RSI break for the Wilshire 5000 right now. We’re exploring the momentum indicator suggested by Ned Davis, specifically Rate-of-Change … or ROC in this analysis. It’s “pure price momentum” and in our deployment — applied across the months and years, perhaps more appropriately tagged “investing momentum.” Any positive value (shaded in green on the graphic) is indicative of price momentum. 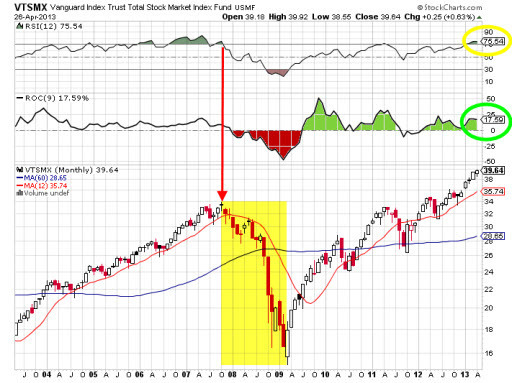 Note the extended period of RSI greater than 70 (overbought) back in 2006-2007. Like we said, markets, sectors and stocks can stay overbought for quite some time and in this case, price momentum is still intact. Shop carefully. Emphasize high quality and financial strength. Eddy Elfenbein on Apple (AAPL) from his weekly Crossing Wall Street note … and a reminder that if you’re owning or watching any of the stocks on his Buy List for 2013, he will help you. One of the big catalysts for the stock market this week was the dividend hike from Apple (AAPL). Although the legendary iStock isn’t on my Buy List this year, the company is so large, it can move the market all by itself. Apple said that it’s raising its dividend by 15% to $3.05 per share. The company is also increasing its share-repurchase program by $10 billion to $60 billion. The combined total of the dividend and share repurchase comes to $100 billion that Apple is paying out to shareholders. To put that in context, the new dividend works out to $12.20 per share for the year. Ten years ago this week, the whole stock was going for $6.60 per share. Apple is now sitting on a bank account of $145 billion. That’s enough to buy every single team in the NFL, NHL, NBA and major-league baseball. Interestingly, Apple is borrowing money for its dividend and buybacks. That may sound odd, but rates are so low — hey, why not? I think the Apple news clearly gave investors a big confidence boost. This was especially true after the AP’s Twitter account was hacked. The hackers sent out some bogus tweets, and within a few seconds, $160 billion in market value was erased. So yeah, that kind of stuff tends to put people on edge. Another sign of a calmer market is that the yield spread between junk bonds and Treasury bonds has fallen to a two-year low. This is exactly what we want to see. Investors are willing to take on more risk with their money. That’s why these higher dividends are so important. They can lure money away from rock-bottom yields in the Treasury market.